AUTHOR: Some of Karissa's favorite things are coffee, chocolate, and superheroes, and she can quote Princess Bride verbatim. She loves to read and has a sweet tooth for speculative fiction. Sometimes her family convinces her to put down the books and take the motorcycles out for a spin, or they'll haunt flea markets, searching for rusty scraps to reuse and re-purpose. Karissa lives in North Carolina with her kid, her husband, the occasional in-law, and a very hairy husky named Bonnie. Karissa is the author of the adult Urban Fantasy series, The Norse Chronicles, as well as the Stormbourne Chronicles, a Young Adult Fantasy series with Evolved Publishing. 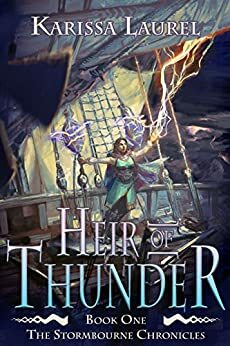 Evie Stormbourne is the last in a long line of rulers who can control the weather, especially thunder and lightning, to a devastating effect. Throughout the generations the power has weakened, though, and when the story begins Evie’s powers are only a pale shadow of her ancestor’s abilities. When her father is killed Evie manages to escape with the help of her father’s master of the horse, a young man named Gideon. Although Evie travels incognito, she is in constant danger of discovery because she is being hunted. There are multiple forces at play, and there are those who want to steal her birthright. Complications arise and Evie is separated from her protector. She is forced to face certain truths about her situation. Why was her father overthrown? Will she avoid the fate others have plotted for her? Does she want to conquer the land her family ruled for centuries? Will she take control of her own destiny? The world contains a mixture of historically accurate devices and steampunk inventions. The amount of technology available seems to depend upon a character’s station in life. For instance, most of the characters travel by horse or sailing ships, but more fortunate others travel in dirigibles. It is a distinctive way to divide the classes. One of my father’s war manuals showed illustrations of that vicious machine, but I had never seen one in reality. Someone with a brain for engineering had rigged this one with a system of levers, pulleys, and gears. A steam engine automated its processes, and every few seconds a conveyer belt fed another iron missile into a waiting bucket attached to a long wooden arm. From this distance, the trebuchet looked like an assemblage of toothpicks and hungry metal teeth, yet its ammunition tore holes through Fallstaff’s stone and mortar like a moth devours a wool sweater. A group of men stood around its base, guarding the machine with rifles and crossbows. This genre mixture can be seen throughout the novel and adds just the right touch of reality. Infantry soldiers protect the high-tech steam mechanism that is needed to tear down the fortress. The machine is costly; the men are more easily armed and replaceable. Another divide occurs with magic. Very few have access to the forces and knowledge to work spells and only the Stormbourne line can control lightning and thunder. That level of magical ability is priceless and guarantees Evie will have a price on her head unless she overcomes her enemies. This is a wonderful steampunk/fantasy series. It creates a very in-depth story world and a cast of compelling characters. I highly recommend the novel. 17-year-old Evie Stormbourne was born to a long line of rulers with power over the thunder and lightning. But over the generations, that power has faded, and her own abilities are relatively weak. After her father, the king, is killed and a sudden revolution leaves her a fugitive in her own land, her only hope for survival is her father's horsemaster, a gruff young man named Gideon. The two travel incognito with the goal of smuggling Evie out of the kingdom, but complications soon arise, and Evie soon finds herself struggling for survival on her own. What's more, things are not as they seem, and her journeys eventually lead her to learn the shocking truth behind her father's death... and her own fate. Disclosure time: Karissa and I are both published by Red Adept Publishing (which published her Norse Chronicles and my Jane Colt novels). I bought this book on my own because I really enjoyed her other stories and this review represents my honest opinion. Anyway, Karissa Laurel's HEIR OF THUNDER is the first in a planned YA fantasy trilogy, and it was catnip to a longtime fantasy fan like me. Heroine journeying across a fictional version of old-timey, steampunkish Europe? Magic and mayhem and twists and turns? Yes, please! Evie travels across various European-esque countries in her journeys, and it was a real delight getting to see the different kinds of lands that make up her world. As for the world... well, let's just say it's got swords and horses and dirigibles and pirates and magic and caravans. A fun mix of Lord of the Rings-type high fantasy and steampunkish tech (did I mention there are dirigibles?? ), blended into a delightful Europe-inspired universe that feels at once new and familiar. All in all, this was a delightful read and just the kind of heroine-centric fantasy adventure I've always loved. Can't wait for Book 2!